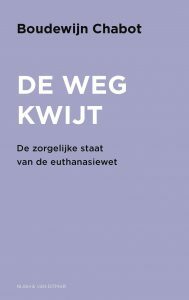 Recentelijk publiceerde Boudewijn Chabot zijn nieuwe boek “De weg kwijt” waarin hij zijn zorg uit spreekt over de staat van de euthanasiewet. De acceptatie van euthanasie bij allerlei nare lichamelijke ziekten is enorm toegenomen. In De weg kwijt legt Boudewijn Chabot de schaduwkant hiervan onder een vergrootglas. Hoogleraar Anne-Mei The valt Chabot bij en demonstreert in haar Proeftuin Dementie hoe je anders kunt omgaan met de angst voor dementie. Hoogleraar Jim van Os legt uit hoe het komt dat psychiatrische behandeling geen hoop meer biedt aan mensen die worstelen met de dood. with Dr. Boudewijn Chabot, by Paul Witteman . On December 7, 2014 Boudewijn Chabot was interviewed in the prime time (Dutch) Sunday tv program by the distinguished interviewer Paul Witteman. Chabot defended theses that are unusual in Dutch right-to-die circles. His position regarding several hot issues is expanded on below. Question PW: Should the euthanasia law be changed to make euthanasia a legal option for elderly who consider their life to be completed? Boudewijn Chabot: In the present turbulent phase of public discussion on this issue I am opposed to a change of article 294 in the Dutch criminal law that forbids assisted suicide by relatives and other laypersons. Right to die proponents should wait for the Supreme Court verdict in the case of Albert Heringa. Only thereafter they can come forward with a better bill than the proposals that have been discussed so far in Parliament. Question PW: Can you summarize what makes this case special? Boudewijn Chabot: It is a very special case indeed. The 99-year old Moek Heringa had several handicaps that are usually related to old age. She felt her life was completed and requested her family doctor for a physician-assisted death. In the Netherlands this would be allowed in her situation provided the doctor would report this and the Regional Review Committee would come to the conclusion that all legal conditions of due care are met. However, her family doctor turned her request down for a personal moral reason. PW: Why would he refuse this if this is legally permitted? Boudewijn Chabot: Nationwide research has shown that most Dutch doctors take the same moral position as the doctor of Moek. They do not want to provide lethal medication [link to Dignified Dying], to elderly persons who feel their life has become bleak and without prospect of improvement. PW: This is really new information! Are Dutch doctors reluctant to provide euthanasia when this is permitted by the law? Boudewijn Chabot: Yes they are. A false image of doctors willing to provide euthanasia has been created in the media abroad. PW: So after this refusal Moek had to go on and celebrate her next 100 years birthday party? Boudewijn Chabot: No, she had not to go on. The position of a child who has witnessed the emergence of a longing for death over time, is different from the position of a doctor. In the case of Moek, her son Albert became convinced that his mother’s death wish was well considered and permanent. He then decided to give his dependent and determined mother a lethal combination of chloroquine with sedatives that is discussed in my guide to dignified dying. A Dutch higher court has acquitted him, in part because he had video-recorded conversations why she wanted to die and how, in the end, she took all the pils herself without any outside pressure to do so. The Public Prosecution will take the case to the Supreme Court. PW: Another urgent problem is the option of a self-chosen death in early and advanced dementia. The euthanasia law specifies that a written advance directive can replace a verbal request for physician-assisted dying. Would that be a solution in a patient with Alzheimer dementia in a stage where a well considered verbal request has become impossible? Boudewijn Chabot: An advance directive asking for physician-assisted dying is definitely not a solution for the thousands of elderly persons who fear that Alzheimer dementia will make them incompetent and thereby not eligible for euthanasia. Boudewijn Chabot: Most Dutch doctors refuse to even consider giving a lethal injection to a patient in an early phase of dementia. They judge this would be too early as the legal requirement of unbearable suffering is not met. Once the dementia has progressed to a stage where someone does not recognize his children anymore, doctors loathe to inject a lethal drug into the vein of an incompetent person unless there are clear signs of unbearable suffering that cannot be alleviated by less radical means (e.g. palliative sedation). Question PW: Is there another solution for desperate elderly who have been diagnosed with an early stage Alzheimer? Boudewijn Chabot: Yes, I think there is a Way Out [link naar Uitweg] for those brave elderly who do not fear to end their life when it has not yet progressed to a serious loss of cognitive functioning that makes them incompetent. They attach more importance to quality than to quantity of life, i.e. years in a confused demented state. It needs courage to face this prospect and inform their relatives and close friends they have already collected, as a precaution in the past, chloroquine or a tank with inert gas [link to helium film] for a self-chosen and humane death. Question PW: Many elderly will not do that in time. What if they are stuck with Alzheimer and have not taken these precautions? Boudewijn Chabot: There is a simple and equally effective alternative although this requires determination. In an early stage of Alzheimer they can still choose voluntary stopping eating and drinking provided good palliative care is available [link to the Eyewitnesses film, to my English book on SED and to the german book on Sterbefasten]. In case a doctor is not able or willing to give adequate palliative care, most palliative nurses are able to teach the carers meticulous mouth care and other means to soften sleeplessnes, pain and confusion. All this is described in detail in my book on stopping and drinking and in the KNMG guideline that has been written by a committee of Dutch palliative care specialists. It can be downloaded for free (see www.knmg.nl 2014). https://dignifieddying.com/wp-content/uploads/logo-stand.png 0 0 r https://dignifieddying.com/wp-content/uploads/logo-stand.png r2014-12-07 13:59:312017-10-16 11:43:24Boudewijn Chabot in "Buitenhof"